Card slabbed in a scratch-free, crack-free holder for your viewing pleasure. However, any marks you see are not on the actual card - scratches are on the sleeve Beckett uses to encase the card or on the INSIDE of the slab (scratched plastic on the INSIDE of the case). DON'T MISS OUT ON THIS GREAT NEW RELEASE! ANY GLARE OR ISSUES WITH SCAN IS IN THE SCAN NOT THE CARDS! Player: LaMarcus Aldridge. Team: Portland Trail Blazers. Set: 2013-14 Panini Spectra Blue. Manufacturer: Panini Group. Year: 2013. Sorry, no exceptions! Attributes: Serial Numbered. Sport: Basketball. This is a 2007-08 Upper Deck Premier LaMarcus Aldridge Premier Stitchings card. This card includes an authenticated autograph of LaMarcus Aldridge. This card is NUMBERED 3 OUT OF ONLY 5! This card is in NEAR MINT TO MINT condition. LAMARCUS ALDRIDGE AUTO ROOKIE. 2006-2007 UPPER DECK. ROOKIE CARD #199. ULTIMATE COLLECTION SERIES. SERIAL # 123/350. LAMARCUS ALDRIDGE 2018-2019 PANINI INSTANT BASKETBALL. GREEN PARALLEL. NBA ALL-STAR - TEAM LEBRON. Shipping by INDONESIA POST REGISTERED with tracking. I will combine shipping at $1 extra. Please wait for my invoice for combining. Thanks & Good luck! 2018-19 Select Basketball Tobias Harris Tie Dye 18/25 Clippers. Condition is Like New. Shipped with USPS First Class Package. Player: LaMarcus Aldridge. Year: 2017. Team: San Antonio Spurs. Set: 2017-18 Panini Spectra Neon Blue. Manufacturer: Panini Group. 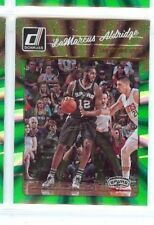 LAMARCUS ALDRIDGE 2017 PANINI INSTANT BASKETBALL. BASE CARD #185. GREEN PARALLEL. "ALL-NBA SECOND TEAM". All of my cards for sale are the cards pictured (scanned) to show condition. The card is numbered 37 of 199. 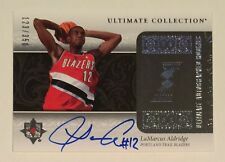 Get this great Aldridge card. Only 75 made! Player: LaMarcus Aldridge. Team: Portland Trail Blazers. Set: 2013-14 Court Kings Portraits. Year: 2013. An order with relic or autographed cards must use the padded envelope option. You are bidding on the card pictured above. Card is serial numbered 9/25. Shipping is $4 to USA only. If you have any questions please message before buying. Thank you kindly for viewing. 2006-07 UPPER DECK HARDCOURT #137 121/399. Combined shipping $0.25 each additional card. Please wait for invoice for combined shipping. Player - LaMarcus Aldridge. Player: LaMarcus Aldridge. Team - San Antonio Spurs. Team: San Antonio Spurs. Numbered to only /2016. Print Run: 2016. Features - Parallel Card. Find More Basketball Cards Here! Player - LaMarcus Aldridge. This parallel card is number 235 from the Prizms Orange set from 2016-17 Panini Prizm Basketball. Player: LaMarcus Aldridge. Team - San Antonio Spurs. Team: San Antonio Spurs. Player - LaMarcus Aldridge. This parallel card is number 2 from the Sunburst set from 2016-17 Panini Revolution Basketball. Player: LaMarcus Aldridge. Team - San Antonio Spurs. Team: San Antonio Spurs. You are purchasing a LaMarcus Aldridge Material Monikers Jersey Autograph from the 2011-12 Panini Limited Series. This card is numbered 14/25. This card will come shipped in a bubble mailer and protective hard cover. I offer a shipping discount for multiple items purchased. It is just .25 for each additional card purchased and a maximum of $3.50 no matter how many cards purchased. International buyers are welcome however see added shipping cost for international purchases. Please inquire if you have any questions. Player: LaMarcus Aldridge. Year: 2018. Team: San Antonio Spurs. Set: 2018-19 Donruss Optic Pink Velocity. Item#: 131. SetType: Parallel. Manufacturer: Panini Group. Attributes: Serial Numbered. 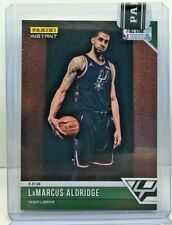 2017-18 PANINI INSTANT LAMARCUS ALDRIDGE GREEN ALL-STAR TEAM LEBRON SPURS #2/10. Condition is Like New. Shipped with USPS First Class Package. Card is in NM-MT condition or better. Player: LaMarcus Aldridge. Year: 2017. Team: San Antonio Spurs. Set: 2017-18 Panini Chronicles Blue. Manufacturer: Panini Group. Player: LaMarcus Aldridge. Set: 2018-19 Panini Contenders The Finals Ticket. Year: 2018. Team: San Antonio Spurs. Manufacturer: Panini Group. Player - LaMarcus Aldridge. This parallel card is number 235 from the Prizms Blue Wave set from 2016-17 Panini Prizm Basketball. Player: LaMarcus Aldridge. Team - San Antonio Spurs. Team: San Antonio Spurs. 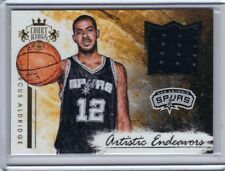 2013-14 PANINI NBA HOOPS LAMARCUS ALDRIDGE AUTOGRAPH HAND NUMBERED 1 OF 1 CARD No.7. 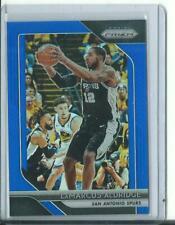 THIS RARE 1/1 CARD OF SAN ANTONIO SPURS SUPERSTAR LAMARCUS ALDRIDGE IS IN GREAT CONDITION SHOWING SMALL EDGE WEAR AT TOP LEFT OF CARD. INTERNATIONAL SHIPPING THROUGH EBAY'S GLOBAL SHIPPING PROGRAM. COMBINED SHIPPING AVAILABLE FOR 2 DAYS. PLEASE USE PAYPAL WITHIN 3 DAYS AFTER THE AUCTION HAS ENDED OR ITEM WILL BE RELISTED. 2006-07 ULTIMATE COLLECTION #199 237/350. Player: LaMarcus Aldridge. Team: San Antonio Spurs. Year: 2015. Set: 2015-16 Panini Gold Standard Gold. Manufacturer: Panini Group. All cards are NM-MT condition (see scan). His 5th All-Star Team Selection! Card is in NM-MT condition or better. Ruby Red, Serial # 43/99, SSP! LaMarcus Aldridge Portland Trail Blazers. "Select Stars" Patch & Autograph Card #16. 2012-13 Panini Select Basketball. dealers and collectors.let us help you as well! Player: LaMarcus Aldridge. Set: 2018-19 Panini Contenders The Finals Ticket. Year: 2018. Team: San Antonio Spurs. Manufacturer: Panini Group. Sorry, no exceptions! Sport: Basketball. Player: LaMarcus Aldridge. Set: 2017-18 Select Prizms Orange. Year: 2017. Team: San Antonio Spurs. Manufacturer: Panini Group. Attributes: Serial Numbered. Sport: Basketball. Player: LaMarcus Aldridge. Team: Portland Trail Blazers. Year: 2014. Set: 2014-15 Totally Certified Platinum Red.